As a new real estate licensee or someone considering a career in real estate, you need to understand the basics of real estate commission, as this is most likely how you’ll be paid. While some brokerages are moving to a more salary-based structure, the majority of today’s brokerages still operate under a commission-based system. Therefore your real estate agent salary will be based on the all-important commission split. You’ll typically negotiate your real estate commission split with your brokerage when you sign on with them. Initially, most brokerages have a standard commission split that they offer to new agents. Once you’ve got some experience under your belt, or reach a certain production threshold, your broker will usually increase your commission split. In a nutshell, the commission split works like this. Say you sell a $300,000 home, and the average agent commission in your area is 6%. First, that 6% commission gets split between the buying and selling agent (3% for each of you). If you’re representing both the buyer and the seller, congratulations: you keep the full 6%. Let’s say you’re representing just the buying side. That 3% amounts to $9,000. Now, you’ll need to share that with your broker. If you’re on a 60/40 split, that means you’ll take home $5,400. Just remember that, as an independent contractor, you’ll be responsible for your own taxes. This number is pre-tax and pre-expenses. Median yearly income is around $42,500. Agents with 16 years of experience or more averaged nearly $78,850 per year. 24% of agents earned more than $100,000 per year. The median gross income of REALTOR households was $111,400 in 2016. Income optimism continues. 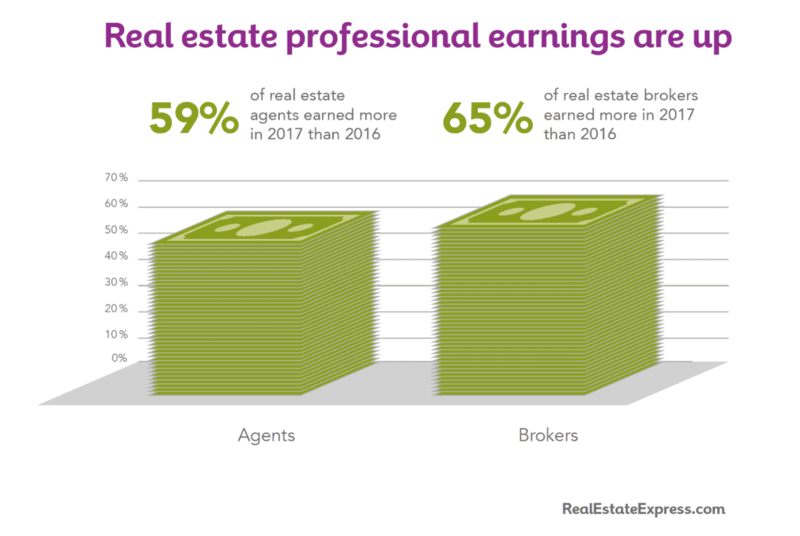 According to those agents who responded to our survey, published in our 2018 Real Estate Agent Income Guide, the majority of both real estate agents and brokers indicated they earned more from the real estate business in 2017 than they did in 2016. Since your real estate agent salary will likely be commission based, how much you make each year will depend on how many sales you have. When you start to investigate a career in real estate, research your target market. How many homes are selling each month in that market? How many agents are there? Is it a big enough market for you to reach your financial goals? If you’re planning to sell real estate in a large metropolitan area, you’ll probably find plenty of business available. But let’s say you’re interested in selling real estate in a small coastal community of the shores of North Carolina. How many homes sell each month? How many agents will you be competing with? What’s the average home price in that part of the country? Those factors will all influence your real estate agent salary. According to the Bureau of Labor Statistics, agents in large metropolitan areas make higher salaries. This is in part due to the number of homes that sell each year. But it’s also because of the average price of the homes they sell. On the other hand, agents in small communities can do very well if they specialize in high-end real estate sales. One of the best ways to increase your earnings potential is through real estate education. For example, you could earn a specialist designation for luxury home marketing or for helping military families relocate. By doing so, you develop a specialty niche that allows you to cater to a wider pool of potential buyers. For more information on how to increase your real estate agent salary, see our article: 5 Ways New Real Estate Agents Can Boost Their Salaries. Ready to start your real estate career? Download our free guide: Is a Real Estate Career Right for You?